This is a section just for you. You are invited to send any news, stories or pictures about yourself or other alumni that you would like for us to post. Send them to me at mlbrou@rice.edu or post a public comment below! We would like to hear from you soon and often. After 30 years in a variety of assignments in exploration and production at EXXON/EXXON-Mobil, I retired in late 2004. I am now the co-treasurer of the Association for Women Geoscientist’s Lonestar chapter, working hard to encourage women and minorities to study earth sciences. I also teach yoga in the Iyengar tradition, do some contract work for EXXON-Mobil, admire my husband’s golf game, and generally stay too busy. I feel lucky to be kicking around and having fun. Kevin is not a working geologist. Kevin is a business solutions consultant for a world famous copier company. He and Loy Harris still talk almost daily. Field camp stories (from almost 25 years ago) still fill many minutes of these conversations. After two years with Anadarko Petroleum, Blanche changed employers. She has worked for Southwestern Energy, located in Greenspoint, since Jan. 2006 and is enjoying added responsibilities and opportunities at this smaller company. She is publishing a paper on Overton field associated with the East Texas Geological Society’s Mesozoic Sandstone Gas Province Symposium in Nov. 2006. Dr. Foss died September 7, 2003 but is remembered as a long-time supporter of the Department. He was a Fellow of GSA, a Fellow of AIME, a Certified Professional Geologist, and well known in the mining and environmental community. His activities with the Department, NASA, and later were captured in a professional memorial (http://www.ela-iet.com/Fossmem.pdf). Mr. Campbell was elected President of the Energy Minerals Division (EMD) of AAPG in 2010. He also was appointed Chair of the Uranium (Nuclear Minerals) Committee of the Energy Minerals Div., AAPG in 2004, and was since appointed a Member of the Advisory Board of the AAPG Division of Environmental Geosciences (DEG). He also serves on the AAPG Advisory Council, and as a Member of the AAPG Astrogeology Committee. Mr. Campbell was appointed a Fellow in the Geological Society of America in 2004. During the early 1970s, Mr. Campbell was Director of a research group that conducted the first EPA research at Rice on environmental subjects, which later funded other Rice departments for more than 20 years. See reports of the 1970s in Mr. Campbell’s CV. James W. Handscy has been nominated for Editor of AAPG. He is Manager of Global Geology for ConocoPhillips in Houston. 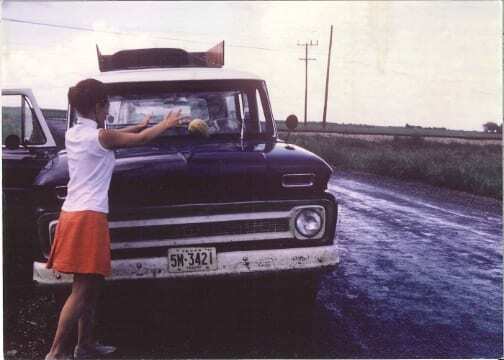 Martha Lou Shirley Broussard in the 1960s throwing a melon onto the department truck to christen it for having just passed the 100,000 mile mark. This was on a field trip with Professor James Lee Wilson to see the carbonate strata down in Monterrey, Mexico. Matha Lou Broussard will receive the Honorary Membership Award at the AAPG Annual Meeting in Dallas on April 18. She received the Distinguish Service Award in 1989 and was the second person to receive Honorary Membership in the House of Delegates in 2001. Martha Lou was the first woman to serve on the Executive Committee of AAPG when she was elected Chairman of the House of Delegates in 1987, She is also the only woman to serve as Vice President of AAPG (1998-1999). Augustus Amund Wellner was born April 18, 2003. He weighed 7 lb.15 oz and is 20.5 inches long. Both mother and son are doing well. Joe and Allison are moving to San Angelo, Texas in July where Joe will take up his new position as Assistant Professor at Angelo State University. He will send his new email address after he moves. I will have a booth at the AAPG convention May 11-14, in Salt Lake City. If you plan to attend the meeting, please come to my booth. My booth number is 1308. I will demonstrate that using my mobile visualization software, HandyGeo, geologists and geophysicists can now visualize and interpret huge 3D seismic data volume anytime anywhere, even on a little handheld pocket pc. I will also have a booth at the EAGE Conference June 2-5, in Stavanger Norway. If you know anyone who plans to go to EAGE, please let me know, I want to find someone to go with me from Houston. Among my memories of Rice in the early 1960s are the great camaraderie with fellow students, both graduate and undergraduate, good courses with interesting professors, and fantastic parties (that occasionally included some of the younger professors). Highlights included the 1962 Geological Society of America national meeting in Houston at which many of us graduate students were pressed into service doing various chores, including showing slides at luncheon meetings and so forth. We were paid off by free tickets to the huge cocktail party in the Shamrock Hilton, where we heartily collected our wages, resulting in several enduring stories that have come down through the ages. Another highlight was the field work in British Honduras [now Belize] with several other graduate students of my initial advisor Ed Purdy, which just as readily resulted in many enduring stories. Also memorable was the great intellectual ferment in developing the interpretations of depositional environments of sedimentary rocks that was fostered by the personnel at the nearby oil company research labs, especially Shell Development where Jim Wilson worked. These professionals, who were probably 5 years ahead of academic research at that time, freely interacted with us students, probably partly because they were not allowed to share ‘secrets’ with competing research groups at other oil companies. This ferment, embodied in Jim Wilson’s courses on ‘Stratigraphy of Depositional Environments’, which I took twice while he was a visiting professor in the early 1960s, was what set me out on my career in sedimentary geology, which has now spanned nearly 40 years at the Kansas Geological Survey and the University of Iowa.